India took the centre stage of Sri Lanka’s May Day Rally. As the PM’s May Day speech centred around why he was giving India this and that while also dragging Japan into the picture, right in front of the Taj Hotel and adjacent to the Indian High Commission, in what was a record-breaking May Day Rally, anti-India rhetoric was blazing across the diplomatic enclave in Colombo. It will certainly waken the Indian establishment to relook at its Kautilya Mandala policy as against the Gujral Doctrine. It was a show of people force that undeniably sent a clear message to India that its incursions were unwelcome and will be objected to unlike in 1987. Obviously, the present government is hanging onto India for sheer survival by doling out the country which in turn has the Joint Opposition promising to nullify all MOUs that the present government is entering into. These are ground realities that India and even Japan cannot ignore and must take stock of. Do they continue to prop up a handful of people whom the people have openly rejected? We do not need to remind of the Indian involvement in training and funding Tamil armed militancy that was used to force the then Sri Lankan Government to sign the Indo-Lanka Accord under emergency law, without media coverage and forcing Ministers to sign undated resignation letters. Eventually Indian troops were to land promising to disarm LTTE in 72 hours and the failure to commit the 5 key clauses that India was bound to do by the accord should have applied the principle of International Law ‘Pacta Sunt Servanda’ (agreements must be kept) both parties must execute their mutually agreed obligations in good faith and the Accord should have been nullified for India’s failure to do so. Instead, Sri Lanka has been carrying a white horse in the provincial council system through the 13th amendment that has proven a failure. The opposition to the Indo-Lanka Accord came in the form of the then PM Ranasinghe Premadasa boycotting the signing and Gamini Jayasuriya resigning from his portfolio. Thousands of youth died unnecessarily. This time round the people have clearly given their verdict to India & the Government. This time round, the people have been wiser. They have now understood that rebel opposition outfits are merely individuals who are on foreign payroll and used to project themselves as an opposition force but in reality are used as Trojan horses for political maneuverings. The slogans of this force at their BRC May Day Rally places the gavel on their coffin as being irrelevant and a force that the people have once again rejected. It is an open secret that India & the West pumped money and used local foot soldiers to run a well-funded campaign that brought this cocktail of political parties & individuals to power. CBK-Mangala conniving’s and scheming’s have lost their sheen and are outdated. What was obviously not planned for was how to remain in power and the policies that were needed to remain in power. Simply propping puppets into power was not enough for a nation of people who were over 90% literate and were quick to realize their folly and accept the fact that they were fooled. India & West who have enough of on the ground teams to assuage the popularity of ‘their’ government must begin to acknowledge its growing unpopularity made worse by the manner that the government is virtually doling out the country to India making even the UNP birth certificate vote base shocked at the manner its leader is selling the country for political survival. India knows too well that it is unpopular amongst its neighbors. The situation in Sri Lanka should make India realize that it has much to lose in particular if the whole country is carrying a wave of anti-India mentality. India is also destroying the traditional friendship Sri Lanka has had with Japan. Japan should not forget Sri Lanka’s role in re-admitting Japan into the international scene at the San Francisco Conference where Sri Lanka spoke in defense of Japan. Japan has assisted Sri Lanka in many ways since cementing a bond that Japan should not jeopardize by falling prey to becoming scapegoats in geopolitics and have the Sri Lankan populace treat Japan with hostility like it does to India. Both India & Japan must realize that they belong to Asia and must be at fraternity with the Asian nations instead of working against Asia. As for India, meddling and peddling in internal affairs of Sri Lanka has taken India to a worst case scenario wherein people are openly advocating even the boycotting of Indian goods and the situation is made worse by the fact that the present Government in particular the PM believes that doling out the country as a gift to India would ensure his political survival even the ascendancy to the role of Executive bypassing the current. The Indian PM can be invited for upteen events but it will not change the danger of India losing its strategic interest by increasing the people’s hatred for India. India and the international community which played on the minds of the youth in pulling off a campaign win for the present government would have noted the large numbers of youth who were present at the Joint Opposition rally. These are the new vote base waiting for an elusive election that the present government is shy to hold. By using India as cover against a wave of nationalist sentiments, the present government is taking India along a path that would be detrimental to India’s diplomatic aspirations. India should note how China has decided to completely disassociate itself from the government having realized that its assurances and its actions are poles apart and have no genuine sincerity and in the East the people regard an assurance as words etched in stone. The frantic visits by heads from both Sri Lanka & India to sign MOUs must surely come with the realization that these are not legally binding arrangements and can be easily nullified and stalled. Many of India’s incursions and interferences have been handled by former leaders with astuteness and must be commended. But it is shocking to see the manner the current government is handing over Sri Lanka’s strategic assets to India the profits should reap for the generations of Sri Lankans not foreigners (India). 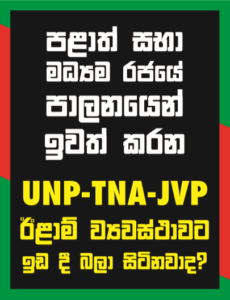 The public commitment made at the UNP May Day Rally to give Trinco port and oil tanks to India should make the citizens of Sri Lanka realize the dangers at stake. When India is pumping millions into developing its own ports in particular Chennai, why should Sri Lanka offer India to develop the Colombo East Terminal when Colombo Port is a direct competitor to India’s Chennai Port? Colombo Port nor Trinco will never be developed. Moreover, in taking the most strategic natural harbor of Trincomalee plus the oil tank storage facility, India will only be using the area as a military base for the Indian Navy and this is going to anger our traditional friends both Russia and China. Given the unpredictability of world politics and the various games being played politically, Sri Lanka will be at the receiving end of any conflict or wars and our people will end up scapegoats and cannon fodder and our traditional friends would desert us simply because we have a set of individuals who are fooling even India simply to survive politically against the wishes of the people. By continuing to prop up showing solidarity towards a rising unpopular government, India is self-alienating itself amongst its South Asian neighbors all of whom have lists of examples to give of India’s interference and incursions while Japan by foolishly getting involved as middle-man will also end up jeopardizing years of goodwill and friendship Japan and Sri Lankans have developed over the years.